I've been selling a few odds and ends on Ebay lately and using the money to buy fun family stuff (a year long family zoo membership, Thomas the train track, etc.). Yesterday I got two packages in the mail that I was very excited to see. 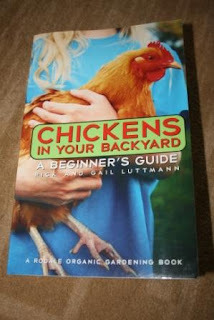 Yes, yes, I continue to dream of having my own chickens. One day, I tell ya, one day! 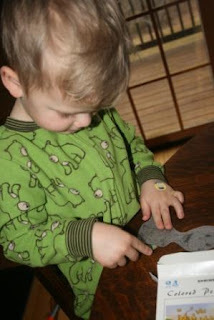 The Shrinky Dinks were for Pierce. Incidentally, they came with a very cute pic of two girls who are selling things on Ebay to raise money for activities like Space Camp. 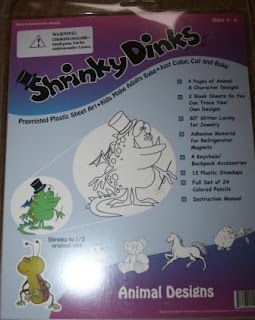 Seller name is childrenfundraising if you want to get some Shrinky Dinks of your own (they have several different packages to choose from). I just knew when I chose this package that Pierce would go for the dinosaurs! He also picked a teddy bear, since we've been reading Paddington. Incidentally, he seems to be ambidextrous. 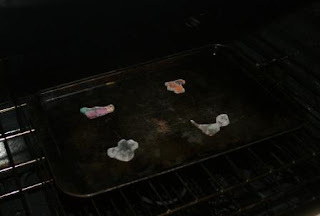 The fun part was watching them in the oven. This brought back all sorts of childhood flashbacks for me. Mostly the memory of the cloying nasty smell of the shrinky dinks cooking. Smurf shrinky dinks if my memory is working correctly. But guess what? Modern shrinky dinks don't reek! Please please please don't look at how dirty my oven is! 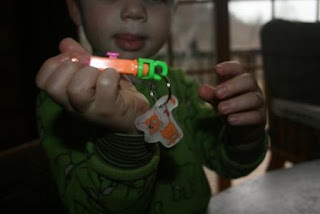 This kit came with the tools to turn your shrinkies into key chains, necklaces, magnets, and little stand up pieces. And I decided to embrace my 80s childhood. I never was very good at big hair. In case you couldn't tell, YES, that is blue eyeshadow I'm wearing! 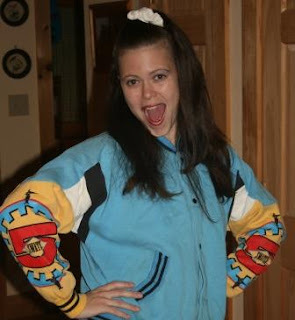 This Swatch jacket was my most prized possession in 6th grade. I still have it (obviously) but hadn't looked at it in years. Hey, still fits. Maybe I should start wearing it around (not). 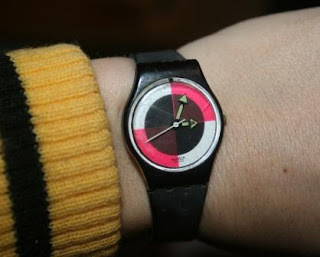 Still got my old Swatch too. It originally had clear purple bands. Now excuse me while I go break out my 80s music. Paul is going to be oh sooooo thrilled. What do you have sitting around in storage from your childhood? You need to make that swatch picture your profile pic on facebook. Hilarious! I love shrinky dinks! You had Smurf and also Incredible Hulk. oh momma L you are soo funny..
posted by annyonymous.. love mom..
that jacket brings back some crazy times..We ALL wore blue eyeshadow back then.. Y? i still dont know.. i havent worn blue eyeshadow since! haha!! And though i never did turn into a girly girl, my fav color is now pastel pink.. haha!! 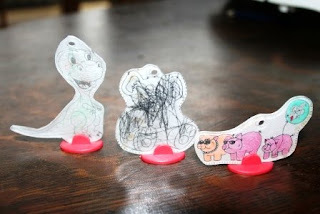 I have THE best memories from the friends I made there..hahaa.. granted moving sassy to the community barn was closer for the parents back then, the friends I made didn't make nearly the impact that the ones at CRHC did..
i will open a blog tonight.. =) shrinky dinks! 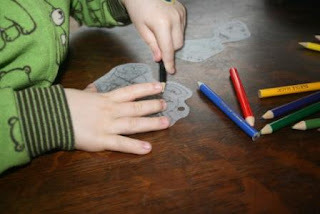 what a nostalgic evening... swatch jackets, shrinky dinks..
first one of them joined the guinea ( a rooster) I saw this morning he is now up to 2 chickens a rooster and 5 guinea.. that all flock together.. crazy.. =D ly! I love shrinky dinks and I have a couple swatch watches too! I also have my speed skates from the 80's.